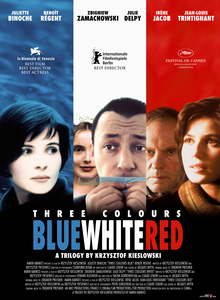 The Three Colours trilogy (Polish: Trzy kolory, French: Trois couleurs) is the collective title of three films directed by Krzysztof Kieślowski, two made in French and one primarily in Polish: Three Colours: Blue (1993), Three Colours: White (1994), and Three Colours: Red (1994). All three were co-written by Kieślowski and Krzysztof Piesiewicz (with story consultants Agnieszka Holland and Sławomir Idziak) and have musical scores by Zbigniew Preisner. Red received nominations for Best Director, Best Original Screenplay and Best Cinematography at the 67th Academy Awards. The trilogy is also interpreted respectively as an anti-tragedy, an anti-comedy, and an anti-romance. A symbol common to the three films is that of an underlying link or thing that keeps the protagonist linked to their past. In the case of Blue, it is the lamp of blue beads, and a symbol seen throughout the film in the TV of people falling (doing either sky diving or bungee jumping); the director is careful to show falls with no cords at the beginning of the film, but as the story develops the image of cords becomes more and more apparent as a symbol of a link to the past. In the case of White the item that links Karol to his past is a 2 Fr. coin and a plaster bust of Marianne that he steals from an antique store in Paris. In the case of Red the judge never closes or locks his doors and his fountain pen, which stops working at a crucial point in the story. Another recurring image related to the spirit of the film is that of elderly people recycling bottles: In Blue, an old woman in Paris is recycling bottles and Julie does not notice her (in the spirit of freedom), in White, an old man also in Paris is trying to recycle a bottle but cannot reach the container and Karol looks at him with a sinister grin on his face (in the spirit of equality) and in Red an old woman cannot reach the hole of the container and Valentine helps her (in the spirit of fraternity). In Blue, while Julie is searching for her husband's mistress in the central courthouse, she accidentally steps into an active court trial and is immediately turned around by security. While Julie is peeking into the courtroom, Karol from White can be heard pleading to the judge in a scene that begins his chapter of the trilogy. Each films' ending shot is of a character crying. In Blue, Julie de Courcy cries looking into space. In White, Karol cries as he looks at his wife. In Red, the judge Kern cries as he looks through his broken window out at the camera. Many main characters from Blue and White, including Julie and Karol, appear at the ending of Red as survivors of a ferry accident. Music for all three parts of the trilogy was composed by Zbigniew Preisner and performed by Silesian Philharmonic choir along with Sinfonia Varsovia. Blue holds a 98% rating on the Rotten Tomatoes website, based on 43 reviews. The second part of the trilogy, White, was ranked with 88% based on 43 reviews, while its final film, Red, was certified "Fresh" on the same website and received 100% based on 51 reviews. Roger Ebert included the trilogy in its entirety to his "Great Movies" list. Ranked #11 in Empire magazine's "The 33 Greatest Movie Trilogies" in 2010. Ranked #14 in Empire magazine's "The 100 Best Films of World Cinema" in 2010. ^ Skrodzka-Bates, Aga (2011). "Clandestine human and cinematic passages in the United Europe: The Polish Plumber and Kieślowski's hairdresser". Studies in Eastern European Cinema. 2: 75–90. doi:10.1386/seec.2.1.75_1. ^ Leong, Anthony. "Demystifying Three Colors: Blue". Media Circus. Retrieved 30 October 2011. ^ "Three Colors Trilogy: Blue, White, Red (1993-1994)". Chicago Sun-Times. ^ "The 33 Greatest Movie Trilogies". Empire. This page was last edited on 5 April 2019, at 21:31 (UTC).